In Rio Grande Valley, Some Campaign Workers Are Paid To Harvest Votes It's a time-honored tradition in South Texas: Local candidates who need votes go to campaign workers known as politiqueras. But some of those workers are now charged with manipulating mail-in ballots. Herminia Becerra is a politiquera in Brownsville, Texas. She has worked political campaigns for nearly 60 years in the Rio Grande Valley. Becerra says she has never been indicted for election fraud, has nothing to hide, and supports candidates without compensation. This week, NPR examines public corruption in South Texas. The FBI has launched a task force to clean up entrenched wrongdoing by public servants in the Rio Grande Valley. In the final part of this series, we examine vote-stealing and election fraud. 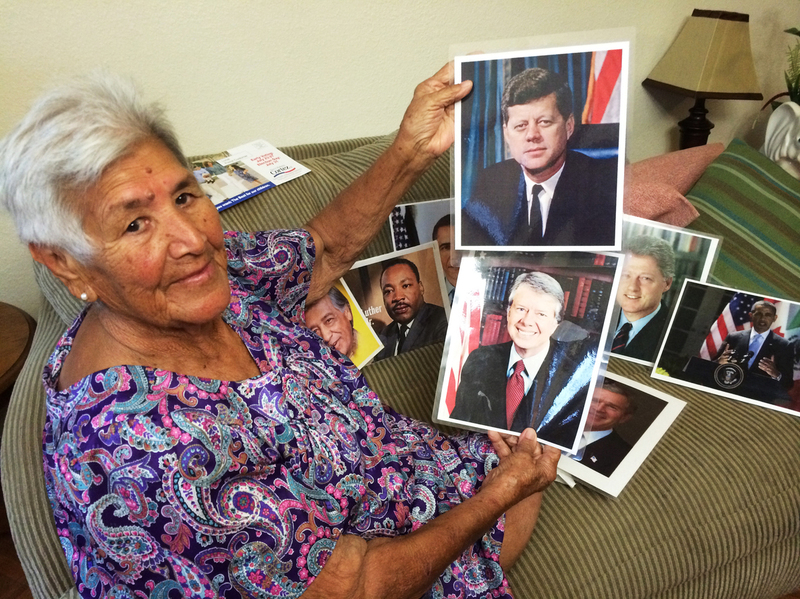 The self-anointed queen of politiqueras in Cameron County is 86-year-old Herminia Becerra. She says she's been working in campaigns for nearly 60 years. Becerra has short, white hair and quick, flashing eyes. She throws back her head and belts out an original campaign song in a husky voice: "Y ganamos y ganamos, con Cesar de Leon. Y votamos y votamos, por Cesar de Leon. Para comisionado de ciudad de Brownsville." "We win with Cesar de Leon. We vote for Cesar de Leon, for city commissioner of Brownsville," the song goes. Becerra is one of few politiqueras in the Valley willing to interview with a reporter. She says she has never been indicted for election fraud and has nothing to hide. She says all she does is talk to voters, hold political signs and shout into a bullhorn. If a candidate needed 200 votes — which in these small precincts can win a race — could she help? "Oh, yes. I know it can be done because I've done it," she says without hesitation. "I know lots of people, and people know me. If I do a favor for you, you're grateful and your whole family is grateful. And you're going to tell your whole family, 'Help Herminia.' "
Hustling votes has a rich political history in America. Chicagoans have been known to vote from beyond the grave. Democratic machines from New Orleans to New York City have hauled voters to the polls. In the Valley, it's all about mail-in ballots. A politiquera has a friendly relationship with a group of elderly voters, who are eligible to use mail-in ballots. They may be nursing home residents, neighbors or clients at activity centers for seniors. 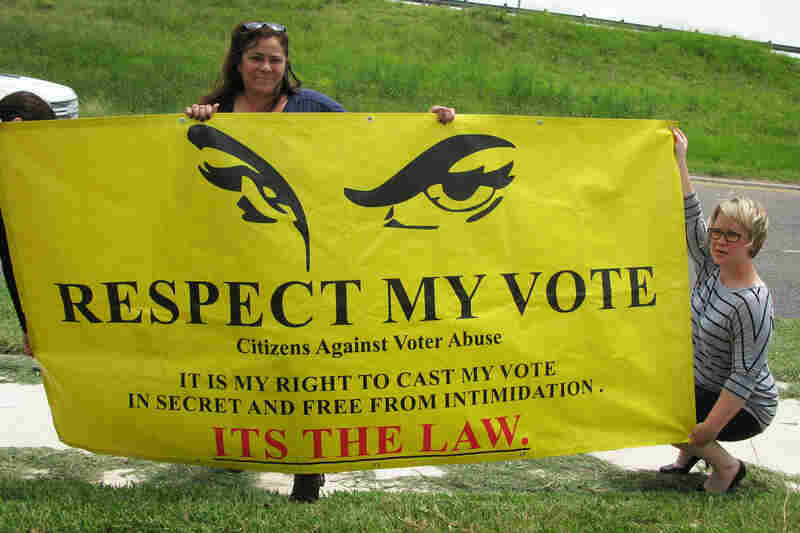 A grass-roots organization called Citizens Against Voter Abuse (CAVA) organized after the 2010 elections conducted hundreds of interviews with elderly Mexican-American women who CAVA believes had their mail-in ballots manipulated. The founder, Mary Helen Flores, gives a typical story. "[The voter] has been cultivated by this particular politiquera who works that building to give up her vote every election," Flores says. "And the [politiquera] will, under the guise of helping her, will come and take her ballot from her and say: 'Well, I'm going to go mail it for you.' "
In the Cameron County indictments, politiqueras are alleged to have charged local political candidates $10 to $20 for every mail-in ballot they delivered. Under Texas election law, an elderly or disabled voter can use a helper, but that person — the politiquera — cannot collect the voter's ballot and then fill it out and mail it later. Mary Helen Flores (center) is the founder of Citizens Against Voter Abuse. Longtime Valley political strategist Mike Carrera says he's glad that prosecutors are weeding out unscrupulous politiqueras. But that doesn't mean they're all bad. Carrera says the ones he hires are paid to know their precinct's voting habits, nothing more. "In every profession, you have extremists. Ninety-five percent of the politiqueras who operate in Hidalgo County don't operate like that, paying for votes," he says. A former campaign manager in Brownsville agreed to talk if his name was withheld, because politiqueras are under criminal investigation. He said a few years ago the campaign he was running paid $3,000 a week for 15 politiqueras to work the mail-in ballots in a local race. He said the campaign did not ask them to break the law, just deliver votes. And he states flatly that Herminia Becerra was one of the politiqueras they hired, a claim she vehemently denies. "Don't ask me if people pay me to get them votes," Becerra says, her voice rising. "Ask God! He'd say, 'No, Herminia didn't get paid. She helps the people.' I'm only interested in helping the poor because I come from poverty." CAVA founder Mary Helen Flores says it's important to clean up Valley elections because residents need honest leaders to address the rates of high poverty and low educational achievement in the region, not office-holders who feather their nests. "In Brownsville, some of these candidates do hire politiqueras, get in office and immediately begin to get their friends jobs, get contracts to their friends and family members," Flores says. "We don't have any enforcement of conflict-of-interest laws here." The indictments of politiqueras in the Rio Grande Valley may be having an effect. In the Democratic primaries in Cameron County for three justice of the peace offices, between elections in 2012 and 2014, the number of mail-in ballots dropped 97 percent.